If you haven’t heard of Snow Fox Skincare, we got you. When this skincare brand launched in 2017, it was with little marketing, a whole lot of science and yes, a simple sales trick called sampling. Formulated originally for severe rosacea-sufferers, the high-tech formula also helps against redness, environmental irritation, dry patches and hyperpigmention. It’s also 100 percent natural, touting only essential oils and herbal extracts (mainly from Song’s native Australia). With only 3 products at launch (a sheet mask, mousse and cream), and after only 6 months, the brand had earned cult status strictly based on results (Kourtney Kardashian is a fan of the Snow Fox Cooling Sheet Mask). Now in the beauty industry, that is HUGE. Fast-forward to today and the mama behind it all, Phoebe Song, is changing more than just rosacea-prone skin. Phoebe with her babe, Zoe, at 1 years old. 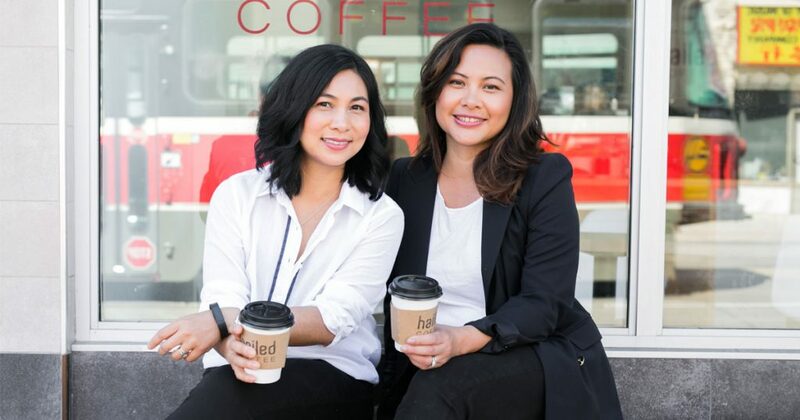 What was you’re a-ha moment when you decided to start your company, Spa Monkey at age 28? “As the parent company, Spa Monkey develops and launches new plant-based, wellness and beauty assets like Snow Fox Skincare, Life Biome and the Quality Control platform. Spa Monkey’s Quality Control started off as a fun, cautionary blog about where to get beauty treatments and what to avoid. It surpassed a million views within months – people started reaching out to us for placements, ads and advice. We turned it into a full-scale quality control platform but realized that it was simply too difficult to enforce without official regulatory measures. It’s still active but serves more like a listing site. Describe the best help you received along the way. “I did have a group of ‘interested investors’ for a while. The moment I got pregnant, they disappeared. Being a female founder in Asia isn’t easy. Being a pregnant female founder is worse. I did not get any real mentors. I did not raise any funds. I was treated like a crippled race horse. Of course, now we get investment offers, partnership deals and collaborations all the time. It’s such a different story once you’ve risen above storm clouds. I don’t hold any grudges – most people can’t see past an ingrained cultural set of perspectives and it’s their loss. What was your reason for integrating traditional Chinese medicine with western knowledge of skincare? “My rosacea was so bad that people were commenting on it in public. I have rosacea subtype II – papulopustular. It’s a skin disorder that causes redness, peeling, swelling and bumps that look like acne, but without comodones so it can’t be extracted. It is medically incurable. I tried all the conventional methods – lasers, peels, antibiotics (oral and topical), facials, fancy products etc. Nothing worked. Some made me worse – especially the oral antibiotics. I ended up ruining my gut health on top of everything. So, turning to alternative health was really an act of desperation. I am living, walking proof that there are alternative natural treatments that work. I’m still not medically “cured” (I agree with scientists and doctors that rosacea is a complex disorder that needs a lot of research), but my skin looks nothing like it used to – to the point where some people are sceptical about my condition until they see my old photos. Snow Fox Skincare has landed on multiple ‘Best Of’ lists for Natural Beauty. What do you think is the appeal, and reason for its success? Why was it important for you to develop a product that is organic and all-natural? “Sensitive skin is more complex and difficult to manage than most people think. What we’ve found is that many ‘sensitive’ skin products are often watered-down versions of full strength formulas, in order not to ‘trigger’ any problems. It’s hard to find products that are potent and effective without triggering sensitivity. Can you share a tough experience that you had to overcome? “My biggest issue in the past was that I was addicted to my work. My husband and baby barely saw me, and when they did, I was mentally away or on the phone. Finally, he sat me down and explained that everyone was sick and tired of being alienated. We made a deal that we would move closer to my family so they can help out. Now it’s a lot better. I am healthier, happier and more productive. The company has grown so much more. My husband and I are managing well, and best of all, we get to watch our beautiful baby girl grow up. How are you able to raise a toddler and a growing business? “Having a supportive partner and home structure is incredibly important. My current arrangement is a little unique but it’s something that works for me. When I met my husband, I was a startup and he was a consultant – both irregular earners. After I got pregnant, we agreed that he would take on a steady job while I work on my company as this was the best strategy — especially since we have a child to provide for. My favourite advice comes from Warren Buffet’s, ‘never test the depth of a river with both feet.’ This was our version of me being the foot in the water, with him firmly planted on land. Thankfully, the teamwork has really paid off – when times were tough we relied on his income, he’s done well at work and now we also reap the fruit of my company’s growth. When it comes to risk, it’s always best to have a strategy that includes a back-up. My sister also lives with us, so she helps take care of my daughter when I’m on business trips and we have a nanny on most days. When I’m not flying abroad for work, I work in my home office which gives me time to really focus on my daughter. Has managing a team taught you a few tricks on being a mom to a toddler? Favourite spa to date and why? Favourite spa treatment and why? You recently created The Life Biome Project, a non-profit organization that provides nutrients with a long shelf life to people living in poverty or disaster zones. Why is this important to you?